More than three decades after a devastating fire destroyed the third floor of a Massachusetts Avenue building, a partnership between two West Side nonprofits is bringing the building back to life – with a rebuilt third floor, affordable housing and a community hub aimed specifically at the area's refugee population. PUSH Buffalo and the WASH Project – with significant financial support from the state – are planning to spend $2.3 million to renovate the vacant building at 417 Massachusetts into nine two-bedroom apartments and an arts and cultural center. Officials broke ground Thursday on the redevelopment, funded by New York State Homes and Community Renewal and other state sources. Seven of the nine apartments are aimed at those earning less than 50 percent of the area median income, and will rent for $600. The other two are for those earning 60 percent to 80 percent of the area median income, and will rent for $900. "Access to affordable, stable housing is a basic human right for all New Yorkers and through development projects like this one we are a step closer to reaching the goals of our comprehensive housing plan," Gov. Andrew M. Cuomo said in a news release. "This significant investment will deliver affordable homes and essential community services to Buffalo's West Side, assisting those who need it most while helping the entire neighborhood grow and thrive." The GDZ Homes project – which stands for Green Development Zone – will recreate the top level of the building, devastated by fire in the 1980s. The red brick, yellow-sided structure was capped off with a roof to protect the interior and tenants occupied the apartments until PUSH Buffalo acquired the building and relocated them several years ago, as part of its redevelopment plan. Plans by PUSH's development arm and architects from ecoLogicStudio call for one first-floor apartment and four others on each of the two upper floors, along with a 17-kilowatt rooftop solar array to power the 9,000-square-foot building at Massachusetts and 18th Street. Lamparelli Construction is contractor for the project, which will take about 12 months. 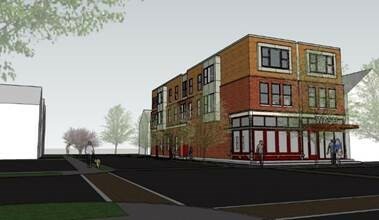 The ground floor commercial space will feature the WASH Project Laundromat and Cultural Arts Center. The nonprofit incorporates the laundry component with art, music, literacy and cultural programming, while providing information to customers about community services and other opportunities, along the lines of a project in New York City WASH is modeled after. The nonprofit – started in 2010 by Burmese refugee Zaw Win after he took over the West Side Value Laundromat Wash & Dry – is moving back to the building after relocating to Grant Street three years ago. Much of its efforts are targeted to members of the Burmese and other refugee communities that have settled on the West Side. "We are so pleased to be able to call home the WASH Project back to their original home," said Rahwa Ghirmatzion, PUSH's executive director. "What I’m personally looking forward to is once again being able to see children from all over the world playing here." The project – unveiled and approved by the city in 2014, but delayed while PUSH figured out how to stabilize the building – is part of PUSH's more extensive Green Development Zone initiative to focus reinvestment and redevelopment in a 30-block area of the West Side. The nonprofit has worked with New York State Homes and Community Renewal on other West Side projects, including the $14.7 million transformation of former Public School 77 into 30 affordable senior apartments. "We’ve been dreaming of this day for over five years and many of you have been dreaming with us," Ghirmatzion told a news conference in front of the building Thursday. "It’s been longer and harder of a road than we expected, so we appreciate your faith and your perseverance that the dream would be actualized. This is truly a testament and a celebration of what a just transition looks like." The venture is funded with $1.7 million in HOME Program funds from the state and $309,210 from the Community Investment Fund and support from the Federal Home Loan Bank of New York, through M&T Bank Corp., and from the New York State Energy Research Development Authority. "It’s the people who believe in themselves that have brought us here today," said Lt. Gov. Kathy Hochul, at the groundbreaking. "This is what you call targeted rebuilding. We are taking this neighborhood, block by block, and bringing it back." The project received property tax breaks through a city payment-in-lieu-of-taxes. "This project will bring new affordable apartments on Buffalo's West Side, adding to the more than 2,000 affordable units which my administration has helped bring to the market since 2006," said Mayor Byron W. Brown.